Has A-11 PM replaced D-2 as the standard wear resistant tool steel? D-2 has been the standard wear resistant tool steel for many manufacturing industries since the 1970's. New developments in technology have provided benefits to the tool steel industry. Common steel terms are explained. We examine terms relating to processing, alloying, properties, strengths and heat treating of tool steel. Introduction to common alloying elements such as carbon, manganese, vanadium, tungsten and silicon including their symbols, density and atomic weight and melting point. Hardness, wear resistance, toughness and red hardness are explained. Machinability, grindability and polishability are also examined. An introduction to tool steel and its unique properties. The role of carbon and its alloying elements are defined. A look at the production of conventional tool steels. The wrought steelmaking process is defined including the introduction of the equipment used in this process. The Powder Metal steelmaking process is examined. A look at the powder metal steelmaking process is examined and compared to the conventional wrought steelmaking process. The process of proper selection of a tool steel is explained. An analysis of the properties used to select the proper tool steel for a particular forming operation. Get all of the answers to your tool steel questions in our comprehensive book "Knife Steel Simplified". This concise book, written specifically for knife makers in an easy-to-understand format includes tool steel properties, alloying elements, data sheets, heat treating and so much more. Improve your knife making skills, discover knife making tips of the pros, learn proper grinding of knife blades and proper heat treatment. Your hobby has become your obsession. 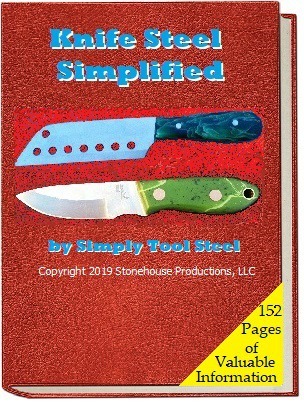 Fuel your obsession by reading “Knife Steel Simplified”. For only $34.95, the cost of only one piece of knife steel, you will receive 152 pages of tool steel information devoted to the knife maker, engaged in the production of high-quality tool steel knives. Selection of tool steel by comparison. Tool steels are sometimes compared to others. This method provides a toolmaker with a baseline for comparison or selection of the proper grade. A look at the common modes of failure of tool steels and how to avoid tool failure. Tool steels have various types of bar finishes. The type of finish chosen is determined by many factors. Check out the common bar finishes. Learn how to properly calculate the weight of tool steel. Calculating the weight is a very useful tool for engineers, machinist and buyers of tool steel. Is tool steel wear resistance more important than hardness? In cold forming operations, production tools wear out and need to be redressed or replaced, but do we understand why? Is it because of a lack of wear resistance or lack of hardness? Sometimes it is difficult to determine.